Safari 5.1 didn’t age gracefully on my older hardware. While Apple’s Web browser still posted fast benchmarks, it grew teeth-grindingly sluggish when loading or navigating multiple tabs. Under Lion, Safari 6 similarly left me more aggravated than appreciative. But under Mountain Lion, the new Safari became a whole different animal. Safari 6 packs relatively few new features for a major browser update, and most of its shiny new bells and whistles need Mountain Lion to run properly. 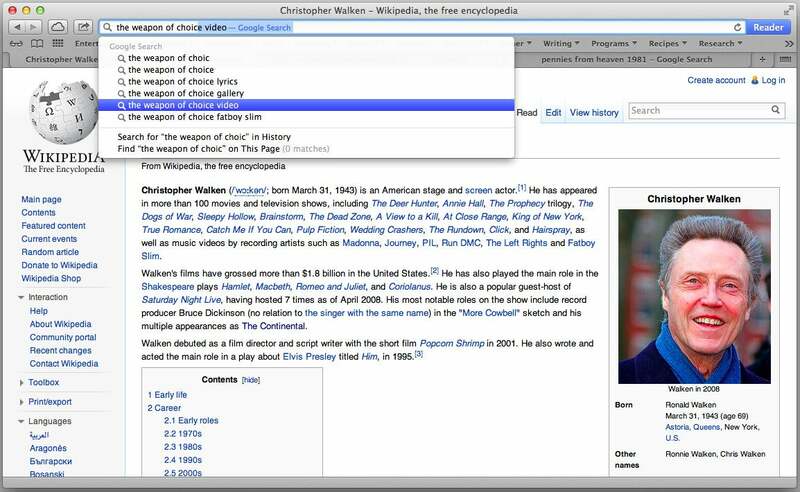 But even under Lion, you’ll see one of Safari 6’s biggest changes immediately. Like Firefox ( ), Safari has consolidated URLs and searches in a single bar at the top of the screen. You search with Google by default, but can specify Yahoo! or Bing in preferences. Unlike Firefox, Safari doesn’t keep a vestigial search box hanging out next to its all-in-one window for no apparent reason. I liked Safari’s useful, unobtrusive implementation of this idea. 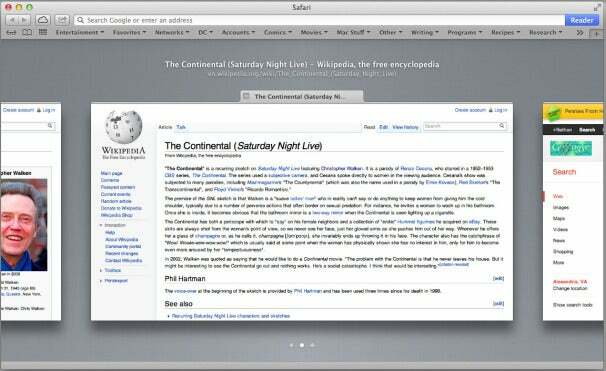 One Bar: A unified search bar and wider, window-spanning tabs represent two of Safari’s most dramatic redesigns. Under Mountain Lion, Safari 6 attains striking poise. The blue progress bar once stuttered across the URL bar; now it glides. Pages slide even more smoothly as you swipe (on a trackpad) to navigate. And the contents of a page seem to pour into place as it loads. Aside from an odd habit of a split-second fade-out and fade-in while the browser reloads a page you’ve just moved forward or back to, everything feels fast and fluid, even on a 2008 laptop. Apple has made Safari 6 on Mountain Lion the Mac’s most visually polished browser. That slickness extends to Tab View, another Mountain-Lion-only improvement. Pinch the screen when using a trackpad (or select View > Show All Tabs, or press Shift+Command+\ on your keyboard), and your current window shrinks into a scrolling cavalcade of all your tabs. This beats puzzling out one tab’s truncated name amid a hodgepodge of others, and it’s more usable and graceful than Opera’s visual tabs. Keep Tabs on Your Tabs: Tab View lets you easily browse through your open tabs. Reader mode gave me headaches in Safari 5, but works like a charm here. After I clicked the new button at the right edge of the URL/search bar, multi-page stories and slideshows from various sites loaded in a flash, each new page arriving as I scrolled to the end of the current one. Ad-hungry websites may groan, but I relished reading a single article without multiple clicks. Instead, I had to use the iOS-style Share button at the top of the page, which also adds bookmarks and sends pages via Mail, Messages, or Twitter. Apple promises Facebook compatibility soon. That isn’t the only Safari 6 upgrade still under construction. On its Web site, Apple promises that Cloud Tabs will let you pick up browsing where you left off on your iPhone or iPad. But that feature won’t fully arrive until iOS 6 appears this fall. For now, it only works with other Macs. Among other new features, Apple boasts better support for HTML5 audio and other emerging standards; more features for Chinese-language browsers; and support for the voluntary, little-adopted “Do Not Track” privacy protocol. I can’t recommend Safari 6 under Lion; its few interface improvements can’t outweigh its surly performance. Under Mountain Lion, it’s a blast to use, and its relatively few additions all prove worthwhile. Other browsers may give you more raw power in some respects, but Safari still delivers the most elegant and enjoyable Web experience. Other browsers may give you more raw power in some respects, but Safari still delivers the most elegant and enjoyable Web experience.